In due time students arrived and the program went on. I honestly don’t remember much about the panel discussion, but something that happened during their visit has stuck with me ’til today. The men came to our suite as part of their tour of the campus. They were accompanied by minders/handlers/KGB — I really don’t know, but some scary looking men. One of the students, Mikail, came to my room. He stopped dead in his tracks as he passed through the doorway and his eyes opened wide like proverbial saucers as he took in the various posters on my walls. You all probably had similar stuff: a Ben Shahn, a Gauguin, a Calder. Puzzled by the question, I answered, “It’s art.” What did he think it was? “Where did you get it?” he asked. Mikail nodded his head and became very quiet. I have often thought of Mikail over the years, especially when the Soviet Union ultimately collapsed in 1991. Had I somehow planted a seed in our visitor’s mind? Was Mikail pondering the freedom we have here? Did he participate in the revolution that saw the end of Communist rule? Did he go out and buy lots of art posters? Why do I bring up that long-ago visit now? Because I wonder if there may be a connection with the mass protests and horrendous violence currently taking place across the Muslim world, allegedly in response to that stupid video produced in California. The protesters live in countries in which their governments control everything, from how they dress to how they can worship to what they can say – to what they can consider art as opposed to what would be branded as heretical. But, with all the technology available today that enables instant communication, including discussion and argument, how is it that people in these countries don’t know how we operate here? That we have the freedom to dress as we like and worship as we wish and to say what we believe, stupid and hateful stuff included. And that we, for the most part, respect each other’s right to do so? Do they not understand this, or do they need to hate us in order to displace their own frustration at being under the thumb of repressive regimes? Perhaps it is because some of these countries restrict access to information from the outside world. According to the Committee to Protect Journalists, Iran, Syria, Saudi Arabia, Tunisia, and Egypt are among the worst online oppressors. Or, is it simply the uneducated, illiterate masses that are goaded into the violence? After all, according to the United Nations, only 66% of Egyptians are literate, 62% of Yemenites, 62% of Pakistanis, 38% of Afghanis, while masses of Libyans (with a 98% literacy rate) are now protesting the deadly and destructive rioters. During the so-called Arab Spring, I prayed that a seed or two of our way of life had become implanted in the students who had come to our universities from these countries, that the idea of freedom had burrowed deep into their psyches, gathering nutrients, so that after a long dormancy was actually about to flower into something beautiful. I hope I will see that in my lifetime. I wonder where Mikail is now, and what he has hanging on his walls. At this time of year, during the Rosh Hashanah celebration of the world’s creation, we are encouraged to engage in serious reflection. In reality, we tend to spend a lot more time in the kitchen preparing big feasts, making beds for the onslaught of returning children, and setting the table. But, this past Sunday was such an absolutely glorious day that, in the middle of making the brisket and setting the table, we decided to take a break. Joel, Avi, and I walked down to this year’s “stART on the street” fair in Worcester. The City had closed off blocks and blocks along Park Avenue to allow over 200 artists and artisans to display their wares. Live music added a joyous atmosphere, as did the aromas of street foods being prepared in trucks lining the route. I marveled at the range and type of artistic talent. There were, of course, the traditional paintings and photographs. But, we also saw jewelry made from recycled glass and pocketbooks fashioned from hardcover copies of Jane Eyre and Wuthering Heights. Quilts and tote bags made from recycled food wrappers hung from one booth, while garden lighting crafted from vintage teacups and saucers was in another. I fell in love with knitted children’s hats that looked like turkeys and hedgehogs. Joel bought a bowl crafted of a beautiful walnut. Now that the holiday preparations are (mostly) behind me, I have had some time to reflect on the meaning of it all. The variety of artistic expression I witnessed at the fair demonstrated for me at a micro level the inspired work of the Big Creator. To wit: The gorgeous weather on weekend and holiday that morphed into a wild wind and rain storm and that returned to calm today. The hummingbirds that return every spring after wintering in South America to feed at my morning glories. The magnificent palette of colors that is beginning to appear on the trees. And most of all, my toddler grandson Max, a one-of-a-kind combination of genes, sweet cheeks, giggles, and mischief. To a Happy and Healthy and Creative New Year! The chicken is the only animal that seems not to have crossed the road out here. One cold and snowy December night, as Joel and I negotiated our way down a slippery, sloping road, a bear suddenly darted out of a neighbor’s yard on the left, crossed the street in front of our car and jumped over the fence surrounding another neighbor’s property. We were somewhat shocked, but frankly excited, to have our first up-close encounter of the bear kind. We also marveled at the bear’s agility at clearing the post-and-rail fence. Not ten seconds later, a deer ran from the same yard and leapt over the very same fence. 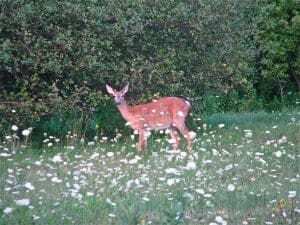 We were thrilled at the deer’s grace, but wondered what could have caused both animals to run like that. And, why would the deer head in the same direction as the bear? Had the lion and the lamb really come to lie down together? Months later Joel and I headed out to dinner around dusk. As we turned onto the main road toward town, a bobcat crossed in front of us. We disagreed as to the kind of cat it was, he believing that it was just a house cat, and I asking when he had ever seen a house cat the size of a Springer Spaniel. Our next-door neighbor confirmed the sighting when she found the bobcat sunning himself in her driveway. Other neighbors have reported seeing bear and moose on our property. Then, a flock of turkeys convened a rather lengthy meeting in the driveway, causing me to be late for an appointment while I waited for them to adjourn. And, ust last weekend, as I was driving to visit old friends, a deer darted from the woods and crossed not 20 feet in front of my car. She did not look both ways before she crossed. 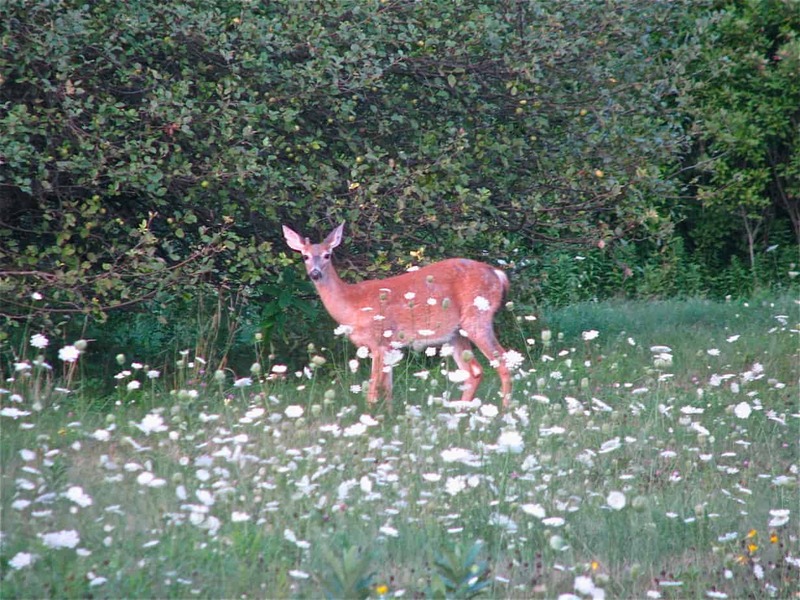 Now, having grown up in the Berkshires, I am well aware that much of it is country, but I don’t recall ever seeing a single deer (or bear or coyote or fox or moose or wild turkey) as a kid. My dad did find a huge snapping turtle once, and my cousin Wilma collected snakes, but that is just about the extent of the wildlife I encountered. Some experts say that, with so much development, there is less forest area for the animals, but still others say that Massachusetts has more forested land now than at the time of the Revolutionary War. So, why are many animals now cross into my yard? Could it be the wild apples growing here? The great view? Or, perhaps the cows pasturing up the road that attract them? Hmm … perhaps they cross here to get to the udder side?